This is Trey Patterson signing back in for my 7th week of ‘Diary of a Baller’. This past week was a thrilling and action-packed week for me. On Monday, there was no school for me, because the teachers had in-service training. So, I took this as an opportunity to work on improving my game, on the court in my backyard. I mostly worked on my jump shot and ball handling skills. On Tuesday, it was a very light day for me. After school, I went to get haircut since I didn’t get one in like 2 weeks. Once I got back home, I used this time to finish up on some homework and study for my math and science quiz that I had later in the week. On Wednesday, I had a workout with DJ Sackmann at the Ranney School, it was really intense. We worked on a lot of situations out of the pick and roll scheme, we learned what moves to use or not to use. Then, later in the workout, we played 2 on 2 to put these new moves to work in live situations. On Thursday, I had another workout with DJ in Wyckoff, NJ. There was so much more traffic than usual getting to this workout, due to the rain, it felt like we would never get there. Once I finally got to the workout, we worked on activating our off hand while dribbling. Also, we worked on this lift dribble move to create space and separation from our defender. On Friday, I had a cross country meet at Gill St. Bernard’s. Normally, I would enjoy running when the weather was slightly chilly, but It was very cold out this day, like it was freezing, and I didn’t feel like running at all, but I knew I had to. Even though, it was very cold out, I managed to improve my personal best mile time to 5:39. I finished 11th place out of 220 runners, and 2nd overall for my school. 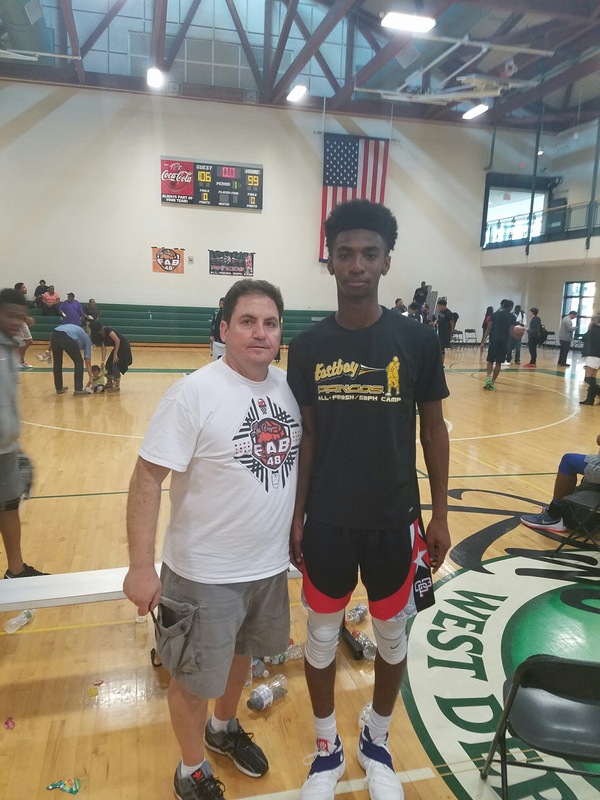 Over the weekend, I attended the Pangos All Frosh/Soph East Camp at Riverwinds Community Center in West Deptford, NJ. I was looking forward to attending this camp, as I have heard so much about the type of competition that a camp like this would bring. I was one of the only 8th graders in attendance, and I feel, I held my own against the older players. The camp consisted of skill stations and a total of 3 games over the weekend. I think I had an outstanding performance at the camp, in front of some national and high school scouts. To cap off the weekend, I was very excited to have been selected to play in the Top 30 Cream of the Crop Game with the other top Freshman and Sophomores. This was a great accomplishment for me, because it proved that I could compete with the top high school players around the Eastern Region. I hope you all enjoyed my weekly entry. Until next time, Trey Patterson signing off!